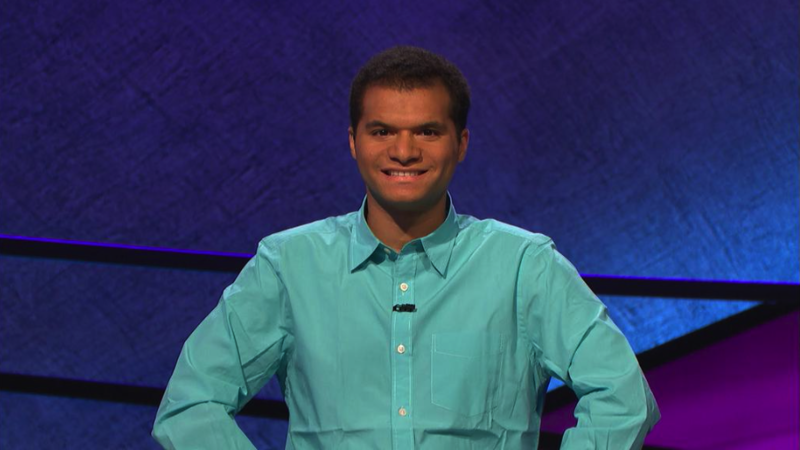 Lightning Round: Matt Jackson, New Jeopardy Record Holder? The owner of this smile is Matt Jackson, a paralegal from DC who yesterday became the 5th person ever to reach 10 wins, putting him 5th on the all-time win list behind Arthur Chu (11), David Madden (19), Julia Collins (20), and, of course, Ken Jennings (74). Given Jackson’s performances so far, how many wins is he likely to finish his run with? Could we be looking at a new record holder? I’ve taken a look at this sort of thing before, back in June of 2014 after Julia Collins had finished her 20 game run. I’m going to use the same methodology here: look at Jackson’s game situations heading into Final Jeopardy, and determine how often Jackson should be expected to win if he continues in that fashion. In Jackson’s 10 games so far, he has achieved 8 lock games and 2 crush games heading into Final Jeopardy. The lock games are easy to deal with – Jackson wins those 100% of the time. That leaves the 20% of the time when Jackson is leading by more than 2/3s of his nearest opponent’s score. In order to lose a game that you are crushing heading into Final Jeopardy, two things need to happen: you need to respond incorrectly to Final, while your nearest opponent needs to respond correctly. So far, Jackson has a 60% correct response rate in Final Jeopardy. I’ll use the historical correct answer percentage for an average contestant in Final Jeopardy to determine the chance that his trailing opponent answers correctly, which is 48.8%. Since both events have to happen in order for Jackson to lose, we multiply the chances that Jackson misses (40%) by the chances that his opponent answers correctly (48.8%). This means that the chance that Jackson loses in a crush situation is 19.6%. Or, in other words, Jackson wins a crush 80.4% of the time. So, 80% of the time, he locks up the game before Final and wins. 20% of the time, he has a crush heading into Final and wins 80.4% of the time. Combine those two probabilities, and you come up with an impressive 96.1% win rate. That is very impressive, close to Ken Jennings’ 97.0% win rate and well ahead of the third place win rate, David Madden’s 85.6%. Does that mean he’s a threat to Jennings’ record? It’s not very likely. Jennings was very good but also very lucky, and outperformed his expectation (a mere 31 wins) by a large margin. A person with a 96.1% chance of winning would be expected to “only” win 24.56 games before losing. In Jackson’s case, we can add his 10 wins to that total to get our current estimate: an astounding but far from record-setting 34 games won. I predict his current chances of the setting the record at 7.2%: possible but unlikely. Of course, this analysis is predicated on him keeping up his pace of dominating the first two rounds before heading into Final Jeopardy. Should he start to leave more openings for his opponents to catch him in Final, or (gasp) actually come into Final behind at some point, his expected win total would plummet. Still, as long as he keeps up this level of performance, I’d expect to see Matt Jackson on our screens for some time to come.